Keeping up with what’s new in marketing technology can make a difference for brands and their marketing teams. But who has time to check all of the important industry websites for news and updates? Timely, well-curated marketing newsletters are the solution. We’ve listed some of the best marketing newsletters out there that you can subscribe to now to keep up with the latest marketing news. Buffer Social: Buffer Social is a daily newsletter of content from Buffer’s blog with social media tips, tools, experiments, and advice. Content Marketing Institute: The Content Marketing Institute’s weekly newsletter provides a summary of their content marketing blog articles and news, as well as exclusive content by content marketing thought leader Joe Pulizzi. Definitive: Convince & Convert’s Definitive newsletter consists of four emails sent every week, focusing on subjects such as digital marketing, content marketing, and social media. Copyblogger: Copyblogger’s newsletter provides valuable information about content marketing that attracts attention, drives traffic, and builds your business. Digiday Daily: Digiday’s daily newsletter delivers their top content to your inbox, and, right at the top, highlights the top digital news updates you need to know. 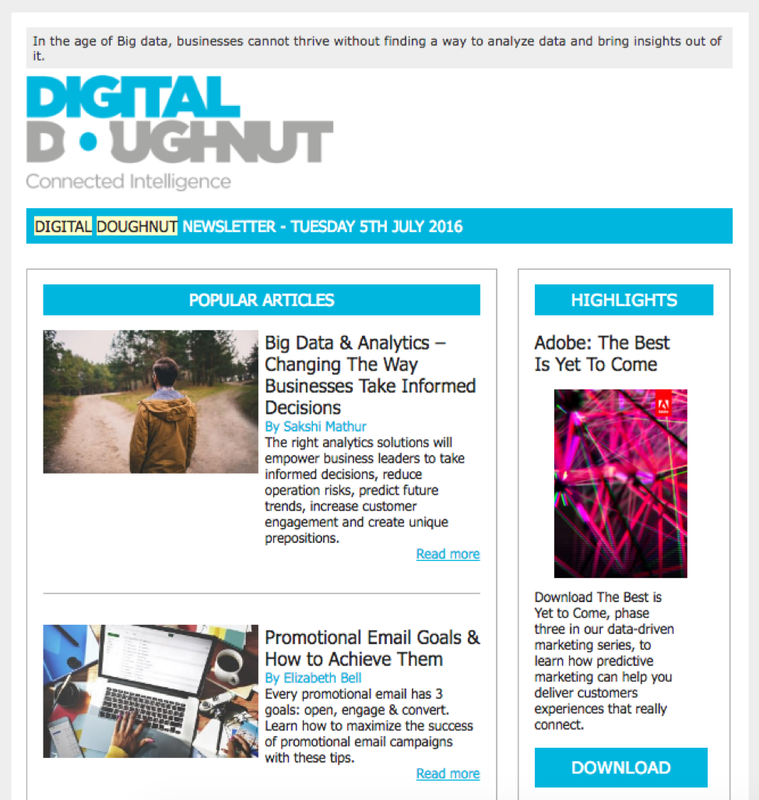 Digital Doughnut: Digital Doughnut emails you insights by digital marketers for digital marketers. GrowthHackers: GrowthHackers will email you top posts from their community-created hub of articles on growth hacking, marketing channels, user acquisition, engagement, product launch and more. HubSpot’s Marketing Blog: HubSpot’s Marketing Blog newsletter includes their top articles on SEO, blogging, social media, lead generation, email marketing, lead management, analytics, and more. Inbound.org’s Digest: Inbound Marketing Email Digest is Inbound.org’s newsletter that highlights their top articles on inbound marketing. 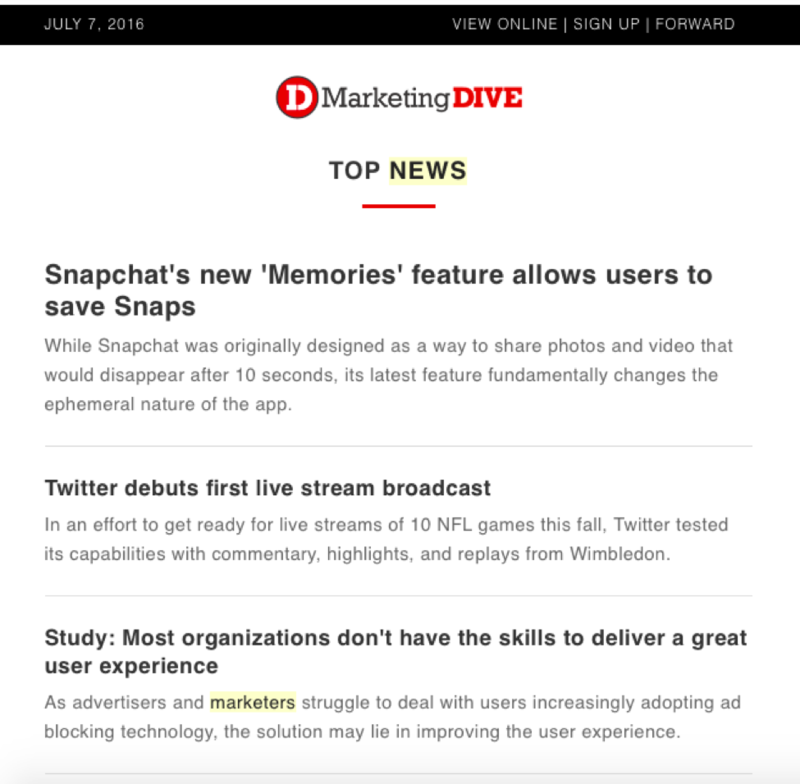 Marketing Dive: Marketing Dive’s newsletter provides you with the latest marketing industry news in 60 seconds. Marketing Land: Marketing Land provides several newsletters on different subjects and frequencies, focused on interactive marketing news, views and how-tos. MarketingProfs Today: This MarketingProfs newsletter delivers daily content with practical marketing insights, lessons, perspectives, and know-how. Marketo’s Marketing Blog: If you subscribe to Marketo’s marketing blog, you will receive their top articles on tips and best practices for digital marketing, email marketing, marketing automation, lead generation, and marketing ROI. The Moz Blog: Subscribe to the Moz Blog’s daily emails with top content with their best advice, research, how-tos, and insights to help you level-up your SEO and online marketing skills. Newscred: Subscribing to Newscred’s Insights blog will get you the best new articles in your inbox three days a week, focused on marketing trends, insights, and best practices. Social Media Examiner: Social Media Examiner will send you their top article on how to best use social media to connect with customers, drive traffic, generate awareness and increase sales. TrackMaven: And of course, you won’t want to miss out on our newsletter! Once a week, we deliver need-to-know marketing trends, actionable “how-to” advice, and industry insights straight to your inbox. Let us fetch the latest marketing news and best practices for you! Don’t see your favorite industry newsletter? Email me with your suggestions!